SAN DIEGO, CA--(Marketwire - March 10, 2011) - Business Review Australia, the leading digital business publication for C-level executives, is pleased to announce the launch of its March issue. In the cover story, "The Best Smartphones for Business Executives," the digital magazine names the top five smartphones from Apple, HTC, LG, Blackberry and Nokia for business execs. In the article, Leanne McCormack of Telcotalk Communications describes the features and functionality of each phone and how they can help improve business. The March issue of Business Review Australia also features company reports to profile business in manufacturing, energy, construction, supply chain and food and drink. Business Review Australia is a leading digital media source of news and content for C-level executives focused on business and industry-specific news throughout Australia. 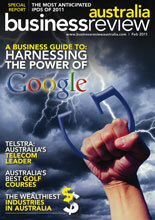 Business Review Australia is the territory-dedicated arm of the White Digital Media Group. Founded in 2007 by entrepreneur Glen White, White Digital Media retains a diversified portfolio of websites, magazines, daily news feeds and weekly e-newsletters that leverage technology to innovatively deliver high-quality content, analytical data, and industry news. For more information, contact 1-760-827-7800 or visit http://www.businessreviewaustralia.com/.